Don't fall off your bar stool, but I have never drank a green beer. I rarely drink beer at all, unless I'm at a restaurant that is running a huge happy hour deal. However, I do enjoy tasting the beer Ogre's been making with the homebrewing beer kit I bought him for his birthday. Sampling beers is fun, but my tummy gets too full to want more than a pint or two. I plan to take only a sip or three of Irish beer tomorrow night to toast to St. Patrick's Day. Don't worry, my martini glasses just happen to be green, so I'll still look festive while drinking pomegranate vodka cocktails! Today I got a holiday head start by hopping through the pubs of Etsy. My thirst was quickly quenched. 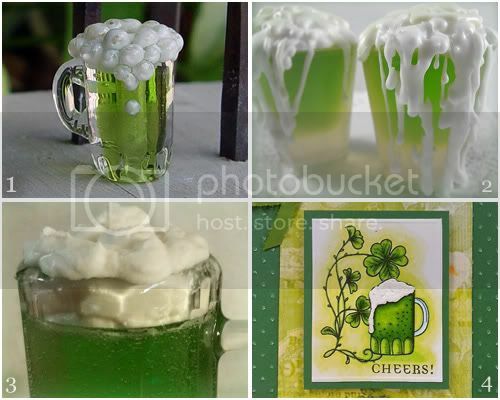 These adorable green beer crafts didn't make my belly heavy like real green beer drafts. Happy St. Patrick's Day!! These are very cool! Such creativity! Fabulous St. Patty's Day post! 8-) believe it or not, I'm not much on beer myself. Way too filling.. lol And thanks so much for featuring my card in your post! Cheers!